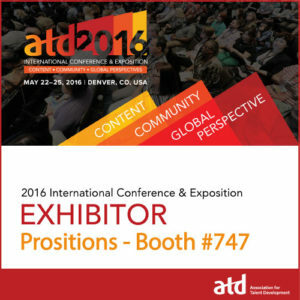 Prositions Features New Courses at Association for Talent Development (ATD) International Conference & Exposition | Prositions, Inc. Prositions Features New Courses at Association for Talent Development (ATD) International Conference & Exposition | Prositions, Inc.
Prositions will be attending the Association for Talent Development (ATD) 2016 Conference & Exposition May 22 – May 25 in Denver, Colorado and will feature courses such as Harassment Education and Retaliation Overview (HERO), More Than a Gut Feeling Platinum, and Make Mentoring Count. Conference attendees who visit Prositions at Booth #747 will have the opportunity to see demos and receive free access to the courses and assessments. More Than A Gut Feeling with Dr. Paul C. Green covers the science of behavior-based interviewing, which explains how a candidate’s past actions are the best predictor of future performance. The course engages participants in a series of interactive, multiple-choice questions that are embedded in the storyline as Dr. Green gives his expert feedback on each response. To learn more about this SCORM-based course or to request a free demo, visit www.prositions.com/more-than-a-gut-feeling-platinum. Prositions’ titles cover topics from mentoring and leadership development to supervisory skills and harassment prevention. These courses can be installed on existing learning management systems or hosted and integrated seamlessly in MentorString, Prositions’ ELMS (Enhanced Learning Management System), to provide organizations with a robust performance support tool unmatched in today’s market. If you are attending the ATD Conference, visit Prositions at Booth #747 for free gifts and a chance to win 10 free year-long licenses. For more information on the show, or to register to attend, visit www.atdconference.org. The ATD 2016 International Conference & Exposition is the largest event for talent development professionals worldwide. It provides attendees with the knowledge, strategies, and solutions needed to effectively train and develop talent. Top highlights include insights into the latest trends, best practices, and new solutions for designing, delivering, implementing, and measuring learning programs.